Violinist and singer-songwriter Lucia's fourth album takes a bold step away from her previous albums, all of which contained a strong element of cross-cultural exploration and fusion, with instrumental high-jinks and songs sung in different languages and much informed by other world traditions. Love, Hope & Tyranny, however, is a deliberately more conventionally song-focused offering than her previous records, and this shows at once in the accessible, punchy Americana styling of her delivery and the assured demeanour with which she adopts this idiom. 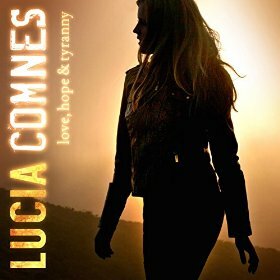 Lucia has penned all the album's tracks, or at least has had a significant hand in their composition, and she tackles the topics of the album's title with confidence and maturity. Her dedicated support crew is able and nimble too, and features the talents of Gawain Matthews, Michael Papenburg and Kyle Caprista as main players. No argument there, and I rather liked what I heard of her fiddling in the band context although it seemed a touch subservient and even underplayed on occasion. Most successful tracks are the feisty Bo-Diddley-rhythmed opener No Hiding Place (which takes no prisoners and holds attention), the brooding Through The Dark, the reassuring Give In To Grace, the solid honesty of If You Knew How Much I Love You and the driving modern bluegrass of There Must be A Reason. The only number that didn't convince me was the Latin-flavoured shuffle Look Again. But even here, Lucia's vocal work is exemplary, and she soars aloft in whatever genre she chooses to drive. In the end, although I can't get over-excited about this record, equally there's nothing to count against it, and Lucia gives a credible, if mildly underplayed, account of herself. Note too, that several of the photos in the package show Lucia cradling an electric guitar (which she's not listed as playing on the album), rather than a violin: an appealing image, sure, and a rather good publicity shot, but also rather misleading and hardly representative of Lucia's contributions to the disc.